The supermassive black hole at the center of the spiral galaxy NGC 4151 has created a structure that astronomers call the "Eye of Sauron," after the evil wizard in J.R.R. Tolkien's "Lord of the Rings" novels. This image is a composite of images taken by several different telescopes. In the eye's "pupil," X-rays (blue) from NASA's Chandra X-ray Observatory mix with visible-light data (yellow) from the Jacobus Kapteyn Telescope in the Canary Islands, which show emissions of positively charged hydrogen. The red around the pupil shows neutral hydrogen, detected by radio observations from the Very Large Array in New Mexico, researchers said. The X-ray emission near the galaxy's heart was likely caused by an outburst powered by the supermassive black hole, researchers said. Scientists have proposed two different scenarios to explain the X-ray emission. One possibility is that the central black hole was growing much more rapidly about 25,000 years ago (in Earth's time frame), researchers said. The radiation produced by material falling into the black hole was so bright back then, according to this theory, that it stripped electrons away from atoms in the gas in its path. X-rays were then emitted when electrons recombined with these ionized atoms. The second scenario posits that material spiraling into the black hole from an accretion disk spawned a vigorous outflow of gas from the surface of this disk. This outbound flow then heated the gas in its path to X-ray-emitting temperatures, researchers said. Both of these scenarios predict that an outburst has happened in the relatively recent past. They imply that periods of high activity are common, making up at least 1 percent of the black hole's lifetime, researchers said. NGC 4151 is one of the nearest galaxies that contains an actively growing black hole. Because of this proximity, it offers one of the best chances to study the interaction between an active supermassive black hole and the surrounding gas of its host galaxy, researchers said. Such interaction, or "feedback," is known to play a key role in the growth of supermassive black holes and their host galaxies. 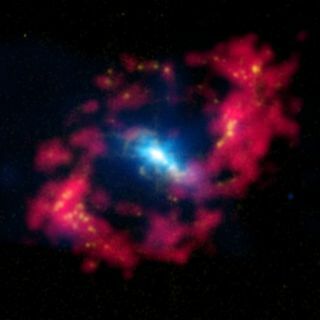 If the X-ray emission in NGC 4151 originates from hot gas heated by the outflow from the central black hole, it would be strong evidence for feedback from active black holes to the surrounding gas on galactic scales, researchers said. With the Eye of Sauron providing so much potentially useful information, perhaps astronomers will now scan the heavens for Gandalf's Staff, or the Mirror of Galadriel.